Finance MEC Alan Winde, second from right, talks to Francois Joubert, right, of the Western Cape Department of Transport and Public Works, and councillors Rose Rau and Brian Watkyns, outside the proposed development site. Photo: Henk Kruger. Cape Town – The City of Cape Town and the Western Cape government have acknowledged that confusion and poor communication have dogged plans to convert 250 hectares between the Liesbeeck and Black rivers into a R15-billion mixed-use property development. Discussions during a city council meeting in September about plans to move forward with the ambitious project, which would include 20 000 mixed-use residential units and an urban park, took residents and those serving on a Two Rivers Urban Park committee by surprise as they had not been properly consulted. The development of the Two Rivers area has been on the planning agenda for almost two decades, with numerous frameworks and proposals being drawn up by different parties over the years. Councillor Rosemary Rau, who represents the city on the Two Rivers Urban Park committee, said the provincial government had previously been poorly represented in meetings about the area. “Information flowed into a vacuum and there was a lot of ‘them and us’ talk.” She welcomed the province’s renewed commitment to the project. “When going into something this big, we look to not duplicate (functions) but also not to create holes, as this hampers development,” she said. Winde said the fragmented ownership of the land was a challenge. 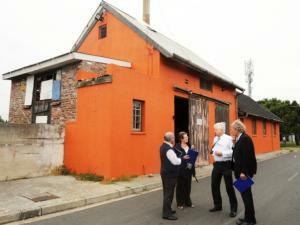 The notion of “this is my Oude Molen, this is my Valkenberg” needed to change, he said. There needed to be co-operation from all involved to “buy into the dream”. The City of Cape Town, the provincial government, South African Rail Commuter Corporation, National Research Foundation and Passenger Rail Agency of South Africa are among the landowners. Some sites are also privately owned. The province and the city met interested parties on Monday to clarify misconceptions about the development, and existing anchor tenants have already submitted letters of interest. Francois Joubert, the director of urban regeneration in the provincial government, said studies were done in 1999 and again in 2011 to look at available infrastructure and constraints. Infrastructure was needed for water, electricity, broadband and fibre-optic networks and transport. “This would cost billions of rand and the city won’t be able to spend that kind of money,” he said. As it would be too expensive to increase the existing capacity, property owners would be encouraged to use alternative sustainable technologies such as solar power. The location of the site, close to six railway stations used by the north, south and Cape Flats lines, made it an ideal node for public transport. Winde said the development was still at the early stages, and it would take six months to a year for all the stakeholders to work through the various plans and frameworks already on the table. The information would be used to draft a single, cohesive plan that would guide the development over the next 15 to 20 years. But Joubert said there was “huge pressure” for the first set of buildings to go up in the next three years. Work would start once the city and province had approved all the rights and plans required. These would be five- or six-star green buildings. Other projects included a Cape Health Technology Park, including headquarters for Emergency Medical Services. Other developments on pockets throughout the site were under way, including the R1bn revitalisation of Valkenberg. Joubert said the boiler room at the entrance of Oude Molen was earmarked as a visitors’ centre for World Design Capital 2014. It may also house scientific material from the Square Kilometre Array headquarters. TRUPA (Two River’s Urban Park Association) is mandated to hold the highest vision for the park. Unless this is recognised and accepted, there is a great possibility of it becoming more commercial and mediocre. The idea is that this will be a Live-Work-Play zone is high on the agenda, resulting in a village type atmosphere geared towards small business development (up to 100 sqm), rather than large scale commercial which will change the energy and atmosphere away from being a central park where people live, work and play. We are concerned that a lack of sufficient Government funds for public developments such as this will bias the development towards the bigger players like that which happened at the Waterfront. The President has declared that we are is dire need to develop small businesses and that this is the way to go. Big business is already developed and can place themselves anywhere but spaces for small business development is really lacking. The opportunity for having a world class central Live, Work Play Park with tourists coming from all over the world will be lost to the detriment of current and future generations. This land belongs to the people of Cape Town and South Africa and the people must have a say for this higher purpose to evolve.